In a bought of inspiration (or distraction) at work, I noted my old 6546 sitting on my desk. After years of looking at this small car I thought, I could make this bigger, and in Technic. Done. The full gallery including instructions can be found here. I decided the car should have a simple engine, four wheel suspension, and working steering. Recently, there was a good design that gave me an idea about how to do a smaller scale driveline for the car. I worked on the rear first, and once I had the suspension setup, I added a small flat four engine place directly on the bottom of the car. This would be the basis for the rear of the chassis. I then started the front suspension design which would utilize the new suspension components from 42021. I first tried adding shock absorbers. Then I added rubber connectors. The first was too big, the second did not work to well. After monkeying with it for a while, I developed a simple torsion bar setup. The torsion axle is a 10l and provides the pivot point to the bottom control arms. They connect to the chassis behind the suspension to a fixed point under the steering wheel. The set up works well. Frankly, it works a little better than the rear as the rear could benefit from stiffer arms and suspension mounts. Next came the body work. As I wanted to keep things similar to the 6546, the coloring would have to be white, green, and red. And it would need some stickers. I used the stickers from set 60025, so the car number would have to be changed from the original #4 to #5. The coloring and markings turned out well. I tried to make sure it was not too busy. Easy enough, and everything is easily acquired so you may build your own. Fitting with my yearly planning I have now completed the two small builds I wanted to complete. It was quick, fun, and a MOC that is accessible for other builders. Feel free to build your own (make some new colors, and we can then have a race). Flat four on the floor. Simple and effective rear suspension. Astute readers will note the heading of Thirdwigg.com has changed to read “LEGO Technic from Grand Rapids.” A slight heading change notes a rather large life change for myself, Mrs. Thirdwigg, and Jr. Thirdwigg. This has caused a slight hiccup to production and the timeline of The Queue, but we are back in business. 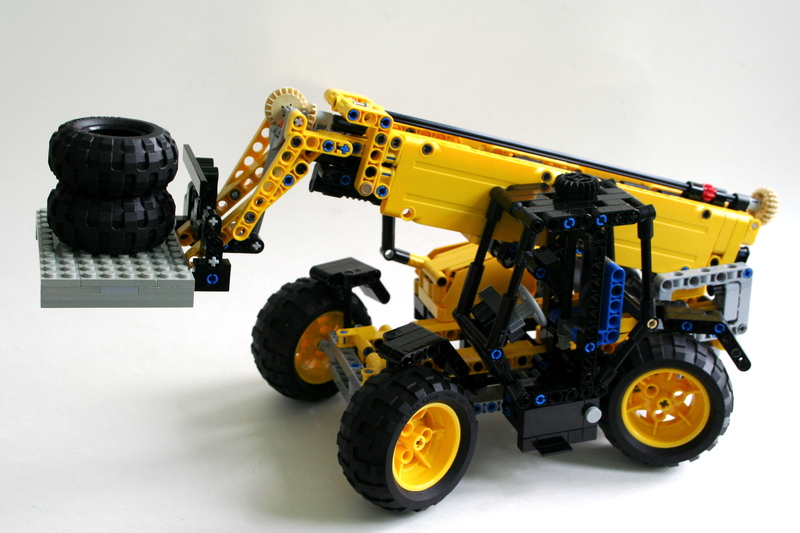 A working telehandler has been on my list of machines to build for a long time. I finally acquired a 32l axle, and it was the impetus I needed to start the project. The full gallery is here. Ready to take on any project. Right from the beginning I decided the MOC would have steering, boom lift, boom tilt, and boom extension. All the functions would be manual as is my current trent (do not fear, it will be over soon), and would be housed within the boom itself. I based the scale for the MOC on the length of the boom being 32 studs so I could use the full 32l axle. The 32l axle was placed on the top of the boom, and would allow the sliding 8z gear to transmit rotation to the fork tilt throughout the full extension of the boom. At the end of the boom I added a mLA to adjust the tilt of the fork. It took a little working, but I eventually figured out how to adjust the tilt for every position in the lift. I then worked on the boom and the extension so it would be as stiff as possible through all points of the lift. I then worked on the chassis and the cab. 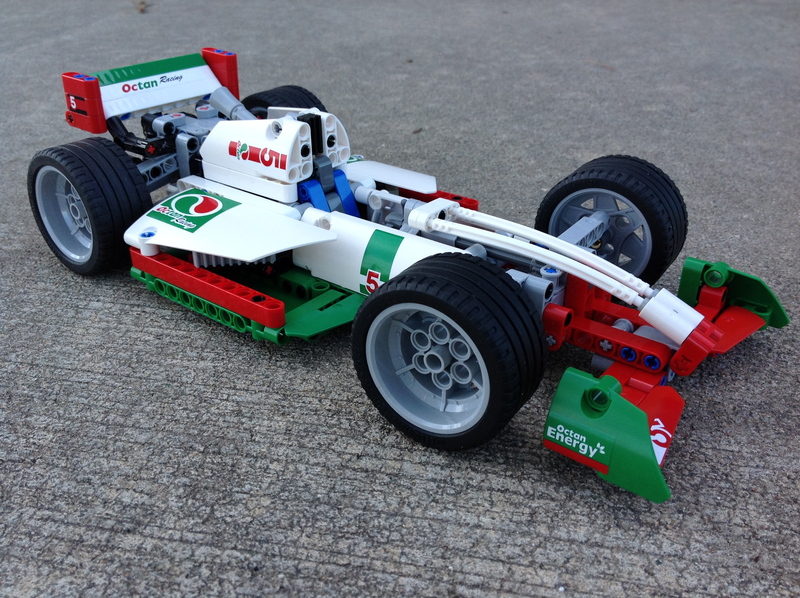 The chassis was rather basic, and after a couple of rebuilds to get the steering right, it was done. I did have to do some revisions to have the boom/chassis interface more rigid. It turns out that when the boom was fully extended, the lift would sway a little too much. I then added a cab and the engine box on the right side. Here you can see the final project working. The MOC worked well, and other than a slight sagging of the boom at full extension, I would not change a thing. Full extension of the boom. Folded, and ready to drive. Three controls on the back.. The bottom of the JCB 531.